• Vehicle System comes complete with vehicle-mountable hard-wire rack and carrying strap. • Standard System comes with AC and DC chargers. Its powerful beam is ideal for field maintenance and inspection of construction sites, utility lines and remote equipment. • Power Failure System comes with AC/DC charges and "smart" power failure circuitry that automatically goes on whenever the power goes off. • Standardized adjustable swivel necks allows 360 degree rotation of lamp head. • Rubberized impact bumper, lens ring and cushioned-grip handle for added toughness and comfort. • Rugged high-impact ABS thermoplastic body is tightly sealed for wet conditions. • Rechargeable to up to 500 times. Model No. LBH-Y (yellow) with Orange Litebox. • Use your Lightbox as a dual use bucket mounted light! This safe & fully non-conductive wrap-around housing offers maximum protection. It allows the light head to be aimed from 50 Degrees below horizontal to 20 Degrees past vertical, with nearly a full 360 Degrees side to side. Constructed of the same quality plastics and durable bracket design you have come to expect from PTI tool trays and aerial bucket accessories. The PTI designed bracket will mount anywhere on the bucket rim and fits most liners. 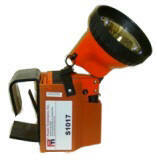 The LBH2 model is for use with lights that have shoulder strap D-rings. The design of this LiteBox® holder allows the light head to be aimed from 50 degrees below horizontal to 20 degrees past vertical, with nearly a full 360 degrees side to side! The One Million Candlepower H.I.D. 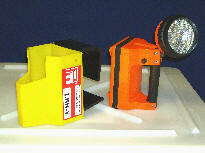 light that illuminates objects up to 1 mile away! The H.I.D. Litebox® has the intensity and peripheral illumination to light an entire scene, plus navigation LED’s for low-light maneuvering. The design of the litebox holder allows the Lighthead to be aimed from 50 degrees below horizontal to 20 degrees past vertical, with nearly a full 360 degrees side to side! This is a power failure system that comes with an AC and DC adapter. Available in Beige only. This light uses a 12 volt DC direct wire mounting rack. AC adapter is sold separately in Lighting. 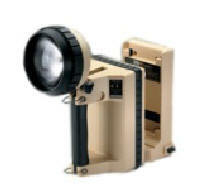 This light uses a 12-volt DC direct wire mounting rack. AC adapter is sold separately in Lighting section. This light uses a 12-volt DC direct wire mounting rack. AC adapter is sold separately in Lighting section.